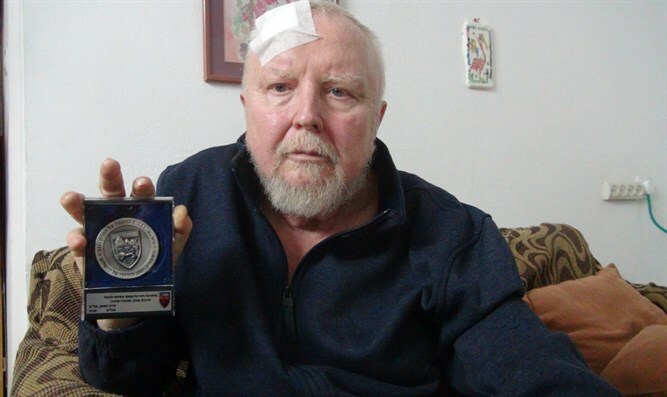 David Ramati, who was injured in Gush Etzion attack, recalls attack in conversation with Arutz Sheva. David Ramati, who was injured in Friday's ramming attack in Gush Etzion, recalled the attack in a conversation with Arutz Sheva on Sunday. “I looked at [the terrorist], and he actually started smiling. A big smile. And I could see in his eyes he was thinking, ‘This Jew’s gonna die,’” he recalled. Once he arrived back on the road, Ramati recalled, he stopped a car that was passing by and explained the situation to the driver and his wife, who immediately called the police, the army and paramedics. “Ultimately, I suffered three shattered vertebrae and three ribs are no longer functional. I don’t seem to have any neurological damage from the head wound, but my body feels like somebody has been using it for a punching bag,” he told Arutz Sheva. Ramati said he is grateful that he survived the attack and expressed his desire to spend more time in building the land of Israel and serving the people of Israel.